Trekkers on a special week-long charity walk this month will be turning to Methil man Bert Hannah for help and guidance. And they’ll more or less have to – as he’s the one who planned the route! Bert is one of an enthusiastic group taking part in Bob’s Walk 2015, an annual excursion in aid of Maggie’s Fife. The party – featuring a mixture of newcomers and experienced walkers, including Mail editor Allan Crow – will be walking between the Kelpies, near Falkirk, and Dundee, from June 13-21, a distance of 117 miles. Bert (68) has previously done a walk from Land’s End to John O’Groats in aid of Cancer Research UK, as well as a Length of Ireland trek – which featured alternate days of cycling and walking – for a school for pupils with cerebral palsy. Also, in his days with the East Fife Male Voice Choir, he trekked from Kirkcaldy to Luss, when the choir had a singing engagement nearby. “I do quite a lot of walking anyway because I enjoy going outside,” added Bert. Originally from Methil but now living in Kirkcaldy, Bert said he’d been impressed when he heard about Bob’s extensive work for cancer research. “Bob Grant was a GP in St Brycedale and in Markinch, and people always talked about him in glowing terms as a doctor,” said Bert. This year’s walk, as ever, will be taking in some spectacular sights. “The Kelpies had just been unveiled, so we thought that would be an iconic spot to start from, especially as they are building a new Maggie’s Centre at Forth Valley Hospital, which is nearby,” he said. An ex-Dundee University student, Bert worked with the world-famous computing firm IBM before retiring at the age of 53 and deciding he wanted to devote time to community-based activities. He’s also had a lifelong awareness of the misery cancer can wreak, having literally grown up with its legacy. His father died of the disease in 1949, when Bert was little more than a toddler, although he said his mum Mary did a great job of raising him and his older siblings. “I’ve always known the effect it (cancer) can have on a family,” he said. Bert is also working with the Friends of Methil Heritage Centre and researching the famous story of Robert Dunsire, the Buckhaven soldier who earned the Victoria Cross during the First World War nearly 100 years ago. 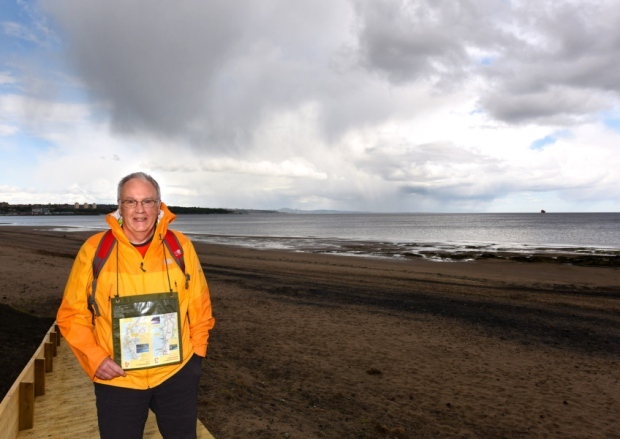 Bob’s Walk has already raised £40,000 for Maggie’s Fife. And not surprsingly, the team there has huge respect for Dr Bob Grant, who will be tackling the walk on crutches. Alison Harrow, the new head of centre, said: “We are so proud of Dr Bob. He is fantastically committed to supporting Maggie’s, both in his work as chairman of our Fife board and also through this extraordinary challenge.” The squad will set off from a point near the Forth Valley Royal Hospital in Larbert on June 13, heading via the Falkirk Wheel along the towpath of the Union Canal to Winchburgh, Kirkliston, South Queensferry and over the Forth Road Bridge to the Fife Coastal Path. They’ll be joined by groups of friends and supporters along the way before arriving at Maggie’s Dundee on June 21. You can also donate by text message.